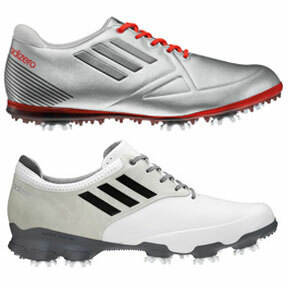 To see the latest golf shoes from Adidas, please visit our adidas Golf Shoes page. The barefoot running movement, which saw a surge in popularity in the early 2000s, is based on the idea that running shoeless reduces the risk of injuries attributed to traditional running shoes. As a result, several footwear companies began to rethink athletic shoe design. More and more "minimalist" shoe models have been released over the past few years, but none have combined the benefits of natural running with modern technology like the new adidas adiZero series. 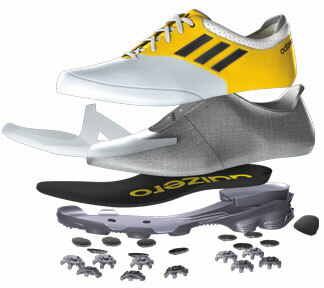 Adizero shoes feature three advanced new technologies: SPRINTFRAME, SPRINTSKIN and SPRINTWEB. SPRINTFRAME is an ultra-thin, ultra-responsive sole made from PeBAX, a patented block copolymer with incredible resiliency. According to adidas, it is the lightest, lowest and thinnest outsole the company has ever created for golf shoes. This translates into a more barefoot-like feel and better ground contact. SPRINTSKIN is a proprietary new microfiber leather used in the adizero shoes' uppers for extra strength and comfort. Like SPRINTFRAME, SPRINTSKIN is an extremely lightweight and thin material. It works like a second skin to accommodate the natural movement of your foot while adding ground protection. 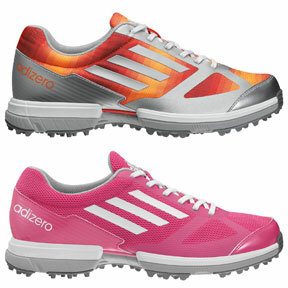 Now let's look at two of the most anticipated new adizero golf shoes: the adizero Tour and the adizero Sport. From outsole to upper, the adizero Tour is built for comfort and performance. The outsole starts with an amazing 1.2 millimeter-wide SPRINTFRAME construction. It then incorporates a 10-spike configuration with adidas's exclusive THINTECH low-profile technology to boost ground grip. The insole of the adizero Tour has two parts. The first is the SPRINTWEB and CLOUDFOAM insole. CLOUDFOAM is a unique polyurethane plastic foam that provides lightweight cushioning. This material is designed to avoid the "heel striking" associated with traditional padded insoles by responding to each step. The comfort of CLOUDFOAM is augmented by the FitFOAM sockliner, which contours to your foot for a custom feel. Similarly, the adizero's Tour Performance Last has a more anatomical shape than that of traditional golf shoe. This gives you more room in the forefoot so that it works more closely with the shape of your toes instead of squeezing them. The upper of the adizero Tour golf shoe is made from SPRINTSKIN with dual-width performance laces. Although the upper and the laces are very strong, they are also very lightweight so that they stay in place without adding stress on your foot. The use of light-yet-strong materials throughout the entire shoe is what makes the adizone Tour the "lightest ten-cleated men's shoe [adidas] has ever created", according to the company. The adizero Sport golf shoe has many of the same features as the adizero Tour, but as its name suggests, it has a more athletic design. The SPRINTFRAME/THINTECH outsole and SPRINTWEB/CLOUDFOAM insole both appear in the adizero Sport, but the outsole uses a 6-spike system instead of the 10-spike system of the Tour model. The Sport also has a SUPERNOVA last not found on the Tour version. SUPERNOVA has a running shoe-inspired shape to promote agility. The other key differences between the adizone Tour and adizone Sport are found in the upper. Although the upper of the adizone Sport does have SPRINTSKIN leather, most of the upper is made from lightweight mesh. Together with the perforated tongue, the adizone Sport offers much more ventilation than the adizone Tour for more intense rounds. The revolutionary materials and anatomical design of the adizone series create a perfect balance between technology and nature. By including only the essentials and then improving them, adidas has made an incredible breakthrough in golf footwear and brought it to golfers everywhere.